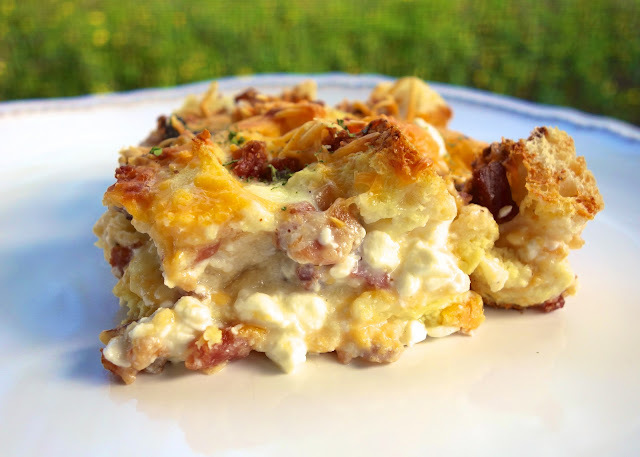 Cheesy Bacon Breakfast Casserole Recipe - bacon, Italian bread, cheddar, mozzarella, cottage cheese, milk, eggs, onion powder, ground mustard and pepper - Can make a head of time and refrigerate overnight. THE BEST breakfast casserole! Great for overnight guests. I've had this recipe pinned for a while. I wanted to make it because the main ingredient is bacon. 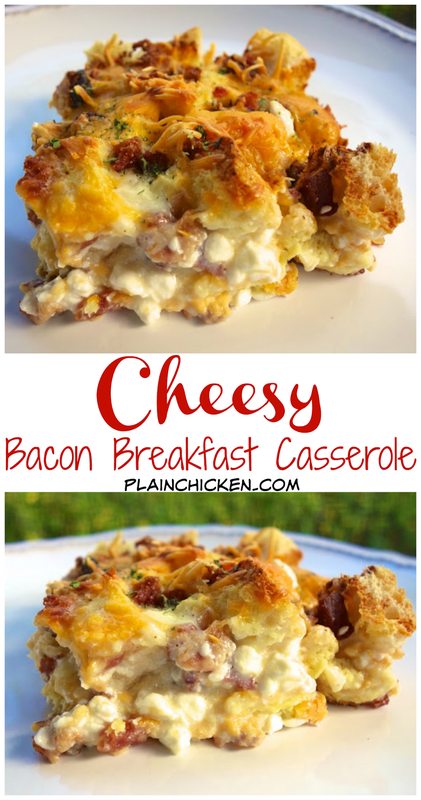 I have lots of breakfast casseroles on the blog, but not very many (if any) with bacon. I tend to use sausage in my breakfast casseroles. I finally decided to give it a try when the nice folks at McCormick sent me some spices to test out. WOW! This is fantastic. I love that the bread gets slightly crispy on top when baked. 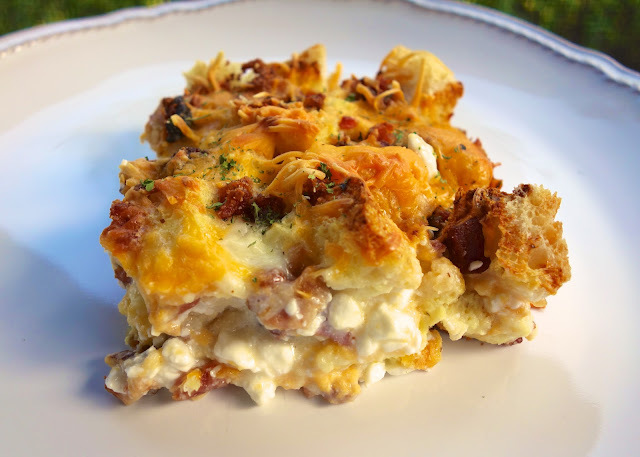 The secret ingredient in this casserole is a layer of cottage cheese. I happen to love cottage cheese baked into casseroles. (I won't touch it cold right out of the container though.) The cottage cheese gave this casserole a nice creaminess. We liked this so much that I have already made it again. Give this a try the next time you make breakfast for a crowd. This would be a great treat for Mom this weekend. Preheat oven to 350ºF. Lightly spray a 9x13-inch dish with cooking spray. Place half of the bread cubes in the bottom of the prepared dish. Top with half of the bacon and cheeses. Spread all of the cottage cheese over the cheese and bacon. Top with remaining bread cubes. Top bread with remaining bacon and cheese. In a medium bowl, whisk together the eggs, milk, onion powder, dry mustard and pepper. Pour evenly over top of the casserole. Bake 40-50 minutes, until golden brown. Allow to cool 5 minutes before slicing. I'm swooning over the looks of this one! Creamy and delicious...with BACON! That looks so good. I love bacon. Have a great week. Oh yeah babe - love the use of cottage cheese - one of my favorite foods. I'm new to your blog...okay, I'm a little slow, sorry. I have "pinned" lots of recipes on instinct that ended up coming from you. I've already made meals to give to friends without even tasting the finished product because I KNOW it is going to be delicious. I'm hooked. thanks so much! Over the years I have, like most people, made many a breakfast casserole. I am thinking that the addition of cottage cheese may make it more creamy, I'm liking that idea! I like sausage in mine though. Also, if you put something with a little zing (some cayanne pepper, cumin, etc) in with the egg mix it will not be so bland tasting. Can this be assembled the night before to bake in the morning?